And just like that, my dreams of playing a super cartoony Ratonga in EQN is gone. Sad day. You’ve probably heard this news from other places. If you’ve been following the whole ordeal of Daybreak for a while, this is probably surprising-but-not-surprising. 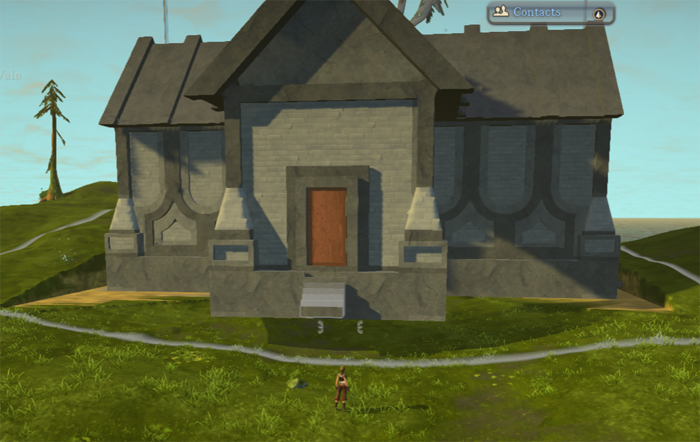 I invested in Landmark’s Alpha. I knew things weren’t going well for a while. I knew the moment that they dropped the blueprint for Landmark and communication trickled down to near nothing compared to what it was before. The writing was on the wall for all of us, but there was that tiny bit of hope that EQN might survive. Interestingly enough, while Daybreak announced the death of EQN today, it also announced the official “launch” of Landmark. I know they have a big patch coming out soon, but honestly, the game does not feel finished enough for a launch. There was so much from the vision and blueprint that has never seen the light of day. The game is no where near optimized for play, IMHO. Oh, and it’s also now $9.99 – not free to play like we were told it would be. Sounds familiar. And now that Landmark folks are no longer building for EQN as we were told we were… I wonder if motivation will fall off even more for the few talented builders who remain. I know they are going to wipe our plots and lock down the size of claims we can have. It’s honestly going to take quite a bit for me to rouse myself to get back in there and find another claim. I’ve been logging in about once a month to hold on to the island that I claimed. But since I’m going to lose it anyway, I might just let it all go. Okay, so the title is a bit of a hyperbole. But, I am disappointed in what I’ve read with the June 2015 Landmark Producer’s Letter. So, last month was a big one for Landmark players. We had the big server wipe, completely new land to claim, new progression, new tutorial, new crafting, new UI. New, new, new. 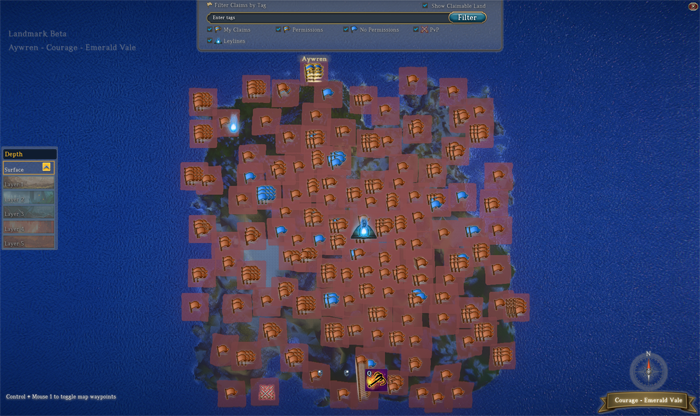 And I was very pleased by all that I saw, thinking that finally, Landmark was starting to come into its own. Starting, though, is the key word. It’s not quite there yet, still being beta. Though the team has been working on squashing bugs from the newest re-start, there are still a number of things that I feel could be more polished. That doesn’t include things that were penned into the Landmark Blueprint a year ago that we’ve never seen (mounts, larger interconnected landmasses, etc). Still, Landmark is in a lot better shape than it was a year ago (when I couldn’t even get 9-10 FPS, making the game unplayable for me). Maybe that’s why all the optimism about the direction it was going made the new Producer’s Letter feel like someone dropped a huge voxel on my foot. As the team has wrapped up the various pieces related to the wipe and the bugs associated with it, we have been shifting our focus and resources over to work on the highest priority tasks and systems that will be used in EverQuest Next. While we do this, we’re working in areas with high amounts of creative risk. This means that while we know what we want to do, we know it will take an unknown amount of iteration, tweaking and sometimes drastic direction changes to get these in game and working the way they need to. Because of this, we simply cannot commit to any dates, because until we get much closer, even our best estimates are educated (but still fairly wild) guesses. On one hand, I understand this. You don’t want to commit to anything you are uncertain of delivering. However, at a time when Daybreak is being held up to the light of great doubt, less communication does not seem like a good idea. It sounds like they’re just slapping a disclaimer on the whole thing to wash their hands of the weight of responsibility that came with the example of total transparency that Landmark was built upon. This also does mean that any features that are Landmark-only are lower in priority and will have to wait until we have time to come back to them. So, as we shift our focus and development to EQN, it just doesn’t make sense to continue with the Blueprint, since the goal of that has always been to provide short term, concrete plans of what you could expect and when, and that isn’t something we can reliably estimate at this point. Basically, taking away the Blueprint is the same as telling us that Landmark is going to be rolled into maintenance mode with very few, if any, updates and no more community input and direct communication to us. It’s very disappointing, considering how very good the last update was for the game. Now it just feels like the team was holding up a shadow box while they got all the pieces in place for that final wipe and big update, knowing that after the fact, they were going to drop the Landmark folks into the abyss of silence. Sure, the game still exists. But it now exists without promise or the interaction with the team we’ve been used to… since the team is pretty much not going to be there anymore. Again, I feel this is a bad choice for Daybreak, especially at a time when they already have earned a lot of doubt from the community. For me, I’m more disappointed to see that the connection the team built with the Landmark community, the thing that I valued most, starting to wither. 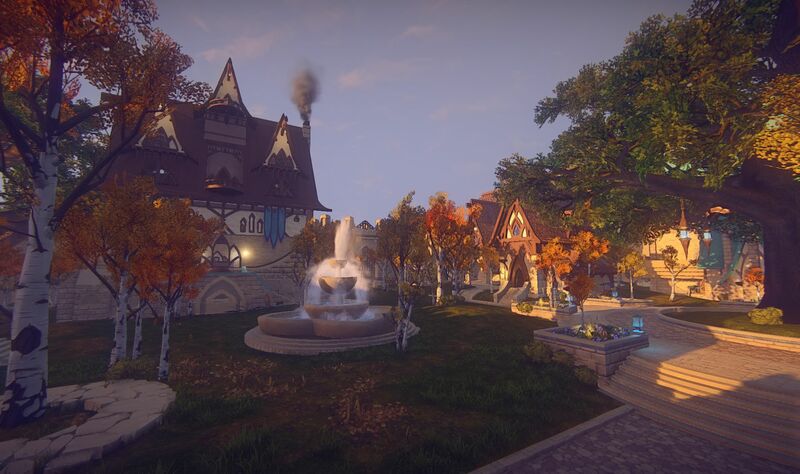 Oh, but they sure can use those creations folks made in Landmark in building EQN. Yep. Landmark and the player community are very important to us and will continue to be essential in the development of EverQuest Next, exactly as we’ve promised from the very beginning. I am disappoint. And a bit soured by this. I’m very hesitant to get involved in any future buy-in alpha/betas from Daybreak. This is the second one that I felt disappointed in so far (the first being Dragon’s Prophet). I just hope H1Z1 doesn’t go down the same road. Last year, I took part in the Landmark Alpha and Beta, and covered a lot of the initial changes to the game as it developed. I actually enjoyed trying to build quite a bit, even though I’m not one of those leet builders who know how to use all the weird, unexpected voxels. However, when Landmark released caves and oceans last year, my FPS dropped to a painful 9-20, making it impossible to do anything in the game. I couldn’t move well, couldn’t mine well, and definitely couldn’t build. On top of that, the upkeep system started to weigh heavily on me. So, when I accidentally lost my claim, I gave up on struggling with the game for a while. Every time the game pushed a big update, I patched and logged in to see if there were any performance improvements. For a good half year or more, there wasn’t. So, I’m really behind on all the changes the game’s gone through last year, but that’s really not so much my fault. Also, whenever I logged in, the world just seemed so bare. Compared to launch days, there were so few claims, and getting to those claims was more trouble than it was worth. When I heard that the servers were getting a full wipe last week, I knew it was a good time to jump back into Landmark to see what had changed. Luckily, I was off from work the day the servers came back up, and saw the announcement on Twitter about 14 mins after it was posted. I jumped back in, made a better character (I really didn’t like the look of my first beta character, but couldn’t bring myself to delete all my progress), and headed out to the Emerald Vale map on Courage. Thankfully, my FPS issues have been fixed, and the game is once again running smoothly as it did in Alpha/Early Beta. So, I struck out to find myself a place to set my flag, which was my first objective anyhow. 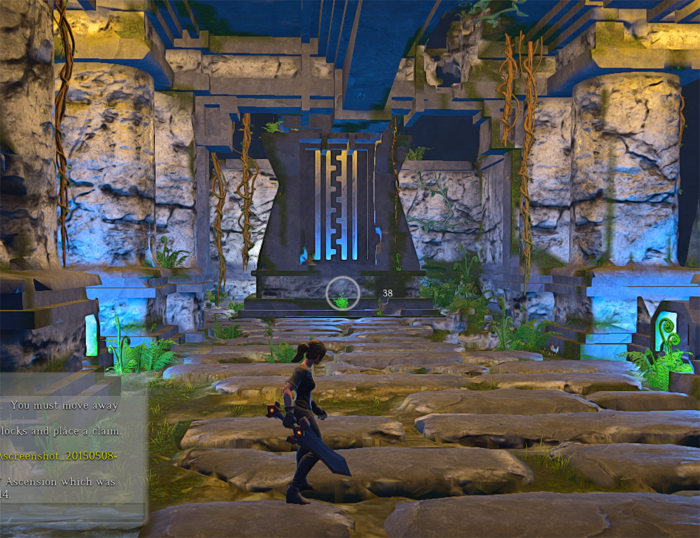 Just about everything in Landmark has changed. Everyone is given basic tools for harvesting and gathering. Everyone is given a land claim flag, instead of struggling to gather the material to make one as quickly as possible to get a claim. Landmark now has a quest tracker sidebar that helps to guide you through your first steps in the Landmark world. These are simple processes that build on each other and unlock new achievements, tools and items as you move through them. For example, as you work through the building quests, the game slowly unlocks each of the building tools. This might be a slight annoying to Landmark vets, but for new players, this may be less overwhelming… and much nicer than having to craft all the building tools like before. All of the islands have been completely revamped and re-created. 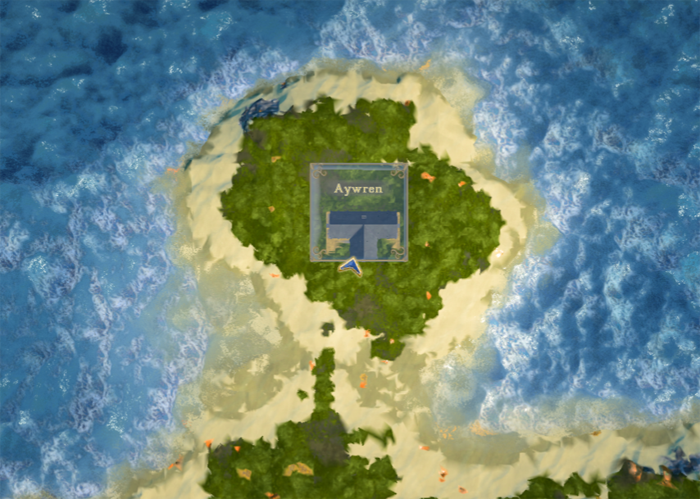 I was able to plant my flag at a little island just off the main continent. The next big change I found was when the game prompted me to place a template house. I checked out templates, which still remembers my old templates, but also includes a number of Daybreak-created stuff. This includes important shapes like arches, cylinders and the like, which are much appreciated for basic building. This also included fully-built and functional houses, complete with a forge and workbench prop. There are handful of house styles, including fantasy tower, desert home, and futuristic type buildings. I picked the more neutral villa and plopped it down, happy that I didn’t have to struggle to build my first home from the get-go. There were some issues where placing the house on a hillside left part of the building floating and uneven ground all around it. But that was nothing I couldn’t fix, once I fiddled around with the building tools and go reacquainted with them. 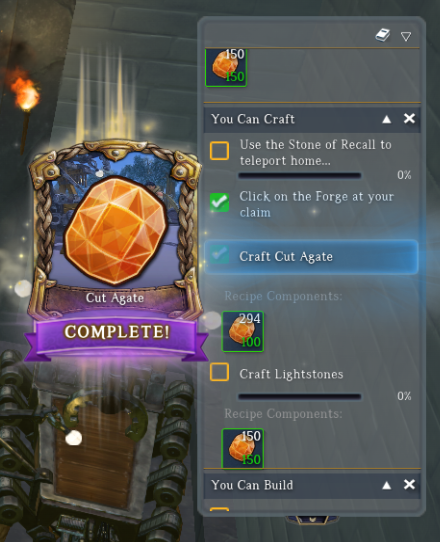 It was kinda nice to have the standard crafting tables from the outset, instead of struggling to build them and hovering around the main portal to use those tables. The tutorial also alerted me to the fact that we can now fly on our claims, which does a lot to help build taller objects, which used to be a pain. Travel is also much, much nicer. From the outset, we’re given a travel stone, which doesn’t seem to have a cool-down at this point. I can warp to my claim at any time. I can also warp to ley lines and to the main portal quickly, which makes it less of a punishment to folks who want to build their claims far away from the center of the map. They’ve dropped all costs for claim upkeep, as well. Instead of being forced to mine tons of copper to pay upkeep, claim upkeep now refreshes the moment you log into the game. This is a good thing as it encourages folks to log in to keep the claim, and also encourages folks to build larger and more elaborate claims, since it’s no longer such a timesink to pay upkeep on additional claim expansions. I found a neat player-made temple, but no monsters. The one snag I’ve run into so far is monster respawn… or the lack thereof. My next objective I need to complete (in order to obtain my pulverizer) is to kill one monster with my sword. That sounds easy, except there are no monsters in the underground areas to kill. It’s a known bug, but pretty annoying, because my quest progress is stopped until this is fixed. I keep checking back, but I’ve yet to find a monster since the servers opened Friday of last week (it’s currently Wednesday). Crafting and gathering have also seen major overhauls, making it much less complex than before. Instead of having to mine up tons and tons of stone and dirt to build with, the common materials are now free, allowing us to build without being hindered by lack of materials. Some folks may not like the “dumbing down” of the game, but seeing the population drop that I saw before the wipe, I believe something did need to be done to encourage people to stick around. Overall, I feel this patch has made Landmark much more accessible to the general player. If you aren’t a wiz at building, you still get a decent looking house to start with and decorate. Those who have the time and ability to do more elaborate things can still wow us with their creativity. As soon as the monster respawn gets fixed, I’ll continue to explore what the new Landmark has to offer.